Salute…Sanur! – There’s life after Kuta…come to Sanur to wet your whistles! My first foray in search of Sanur’s watering holes was with Jill my editor and Carlos the photographer. We rendezvous at Arena Pub on the Sanur Bypass road. It has a well stocked bar, excellent food with a soft interior that lends itself to being slightly up market though the price of drinks are surprisingly reasonable. Well-intended advice by a geriatric at the bar who gave us a “how to and where to go” on the bars in Sanur turned out to be truly disappointing. However, there were a few that stood out – Double Dutch and Cat & Fiddle. DD is about a year old so the freshness of the ambience; the live band and the tables laid out in the open at the entrance presents a stylish picture. Henk, the manager, offers us the two popular cocktails but not before Carlos and I have had our shot of Jim Beam each. Double Dutch Illusions is made with vodka, coconut liqueur, melon liqueur (Bali moon), lime juice and pineapple juice. It was served in a special glass that looked like an out of shape body builder with a sagging bottom. I asked Jill her opinion as she sipped the cocktail. “Too green” she muttered. The DD Mojito concocted with Bacardi rum, limejuice, lime wedgies and brown sugar was tempting. Jill, the connoisseur, tasted the drink glanced away and uttered the words we were waiting for “Nice”. The night dragged out sitting in Cat & Fiddle, the quiet evening broken only by the gentle strokes of the guitar by Carlos playing Hotel California and a tattooed man dressed in black wearing dark gogs with the air of a war vet from the sixties who was grooving it with a local. Jill bored after eating her Guiness Pie decided we needed to move on. So off we went to Wayan Bali and Jazz Bar & Grill. No joy just an over anxious singer screaming into a microphone. It was late so we all headed home to nest. Carlos on his scooter, Jill in her classic VW and me in my Feroza of ten thousand rust spots held together by a coat of paint. Reaching Ubud and still in the mood to play I dropped by Flava Lounge which was swinging. It was Flava’s mid week high jinx. Here I met a few friends and the piss started rolling to the tune of Clapton, Steppenwolf and the thumping sound of gyrating hipsters on the dance floor. Oh Ubud ! The last refuge for the “movers and shakers” when all other venues were closed! The following day I got a call from Jill who promptly instructed me to revisit Sanur. To walk the streets again in search of the elusive Bars for that drinking experience that went beyond the Pale Ale. Maybe I would find what we were looking for in the curious mix of Bars, Restaurants and places called Flashbacks (wonder who comes up with these names?). So here I am traversing the streets and what do I chance upon? Lazer Sport Bar and close to it Zoo. These Bars are quintessential classic hang outs for those wanting to sip the nectar of the island, Arak, and the other drinks that satisfy the soul to the rhythm of live bands. The feel of the place is one of relaxed enjoyment with soft lighting, wooden tables and chairs. It is like a cross between a French café and a Bombay Iranian teahouse. The girls at Lazer quickly fix me a Lychee Sensation, a soothing blend of Bali Moon, pineapple liqueur, lychee juice, grapefruit juice and fresh lychees. Tiredness retreats and I feel alive again to someone singing, “You can’t always get what you want”. A short walk down Jalan Danau Tamblingan I come across a quaint outlet, Ana’s Warung, with a few tables and a homely bar. The beer luggers hanging around greet me with “Hey you in the panama where the f…k are you going?” followed by “Give him a beer he needs a break”. I get a beer courtesy the barrel chest Neanderthal. Wayan who hands me the beer smiles coyly and asks to be photographed. I oblige her. A large TV screen at the end of the Bar is showing a live football match. I gulp down the beer, burp and leave the place. Further down the road is Gasoline Ally a place similar to Zoo and Lazer Sport Bar. It’s very entertaining with a good mix of customers, staff, drinks and music. Along this stretch are Gita’s, Trophy Bar, Randy’s Bar, Kafe Aladin, JJs, Fat Tuesday and many more. Am advised by a helpful cabbie that I should visit the beachfront bar called Bonsai Café. After a short walk past the Bali Seamen’s Club I enter the sprawling grounds of Bonsai Café. The entrance has hundreds of bonsai plants neatly arranged. It’s has a large odd shaped Bar and seating for more than a hundred people that spills out onto the beach. The cool sea breeze wafting through the place with a barbeque sizzling away makes for a perfect picture of what a bar should be. The check table covers and the bilious green plastic chairs are surreal: Like Dali, high on Arak, who has gone berserk with his paintbrush. Made Suardana who is one of the owners accosts me. He gently takes my hand and leads me to the bar. Politely he instructs the bartender to make the two cocktails that the place is famous for and then launches into explaining his favourite hobby, Bonsai plants and how he is world famous blah, blah, blah. Thankfully the first of the two cocktails arrives! I photograph it before tasting it. Big mistake. Made sends the cocktail back because he wants it to be properly garnished. Minutes later (which seemed hours) its back looking like a tart dressed for the night out on the town. I hurriedly sip the Bonsai Sunrise. I suggest he change the name to Bonsai Sunset. No luck. The drink is a combination of Arak, Bacardi, orange juice and grenadine. The second cocktail, Pinacolada, is presented with a flourish. It is served in a whole scooped out pineapple. It’s a concoction of dark rum, light rum, pineapple juice, and vanilla ice cream. It is too sweet for my liking. I desperately need a real drink. So I order another called Body Heat made from Malibu, banana liqueur, Bacardi, pineapple juice, orange juice and lemon juice. No joy, its too sweet and too sour. Kadek at the bar suggests I visit the two naughty bars located on Jalan Danau Toba a short drive away. So off I am to TKs and Limpling. The night is playing out well. Tks is a very small bar. The bar takes up one third of the floor space. The rest of the area is decorated with two small divans and a few chairs. The pink and mauve walls glow in the light of the red Chinese lanterns. A few hostesses lounge around smiling at the customers. I ask for their special. Julia brings me a drink that looks like water with a lot of ice. I sip it and gasp. It’s like drinking gasoline. “What’s this” I ask her. She grins and replies that it is Tks Special, which is made of large pegs of Arak, vodka, a twist of lime and a hint of tonic water. Just then Dire Straits starts playing Sultans of Swing, I relax and sink into oblivion only to be rudely disturbed by a slap on the back and a “Hiya Mate”. It is Peter a long time resident of Padang Bai who has come to meet his friends who own the bar. Soon Fuji, the owner, and his wife arrive and we sit down to drinking the firewater that is liberally served out. According to Fuji the numerous “special” local bars are called “Café”. The famous ones are Hello Bali, Ramos, Jegeg and Merpati. Here the blend of expats, tourists and locals coupled with pulsating music, flashing lights and spirits flowing freely across the bar makes it a place not frequented by the faint hearted. “Café” is a euphemism for having a good time. The timings are nocturnal and prices reasonable. On my drive back to Ubud I stop by Merpati Café on the Sanur Bypass road. The entrance is lit up with purple lighting. The rhythmic beat of music emanating from the place is seductive and inviting. However I am refused admittance as am carrying a camera. Sanur has a fantastic range of Bars and restaurants with some of the best live music in town. 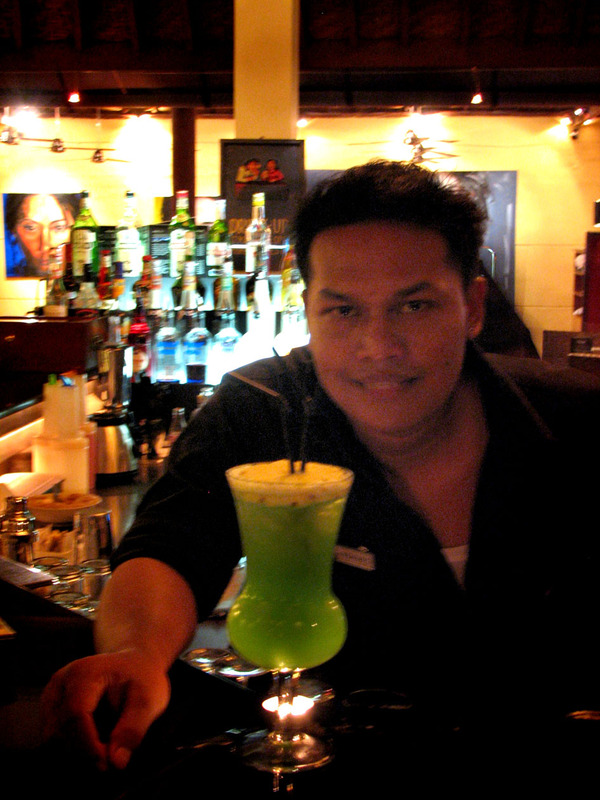 The exciting range of drinks and cocktails served by energetic staff makes it an entertaining experience. For your reference I have included a list of Bars that both my friends and I have visited. Am sure you will help us add to the list when you have come to Sanur to sample the delights. Lazer Sport Bar, Jazz Bar & Grill, Gita’s, Double Dutch, Gasoline Ally, JJs, Bonsai Café, Zoo, Cat & Fiddle, G Point, Beach Cafe, Arena, Spirit & Jazz, Tropy Pub, fat Tuesday, Randy’s Bar, Wayan Bali, Kafe Aladin, Manggo Beach Bar, Toot Sie, Seven Seas, La Barracca, Made’s Pub, Corriander, Kalpatharu: naughty bars like TKs and Limling: and of course the ubiquitous cafes like Hello Bali, Jegeg, Ramos and Merpati. Best days to Bar hop: Fridays and Saturdays from 9 pm onwards. Dances with Dolphins…And homage to Lord Ganesha. Bali, the name only conjures up idyllic beaches, sun tanned heavenly bodies and massages that electrify your very soul. Or, so I thought till I decided to drive like a headless chicken through the countryside armed only with a smile, a map of the island and complete ignorance of the language! The usual expats smirked and nodded their heads in disapproval. Buddy, they said, you’ve got a touch of the sun to do this. Having driven on Indian roads has its distinct advantages, I told them. And then went on to describe the experience of driving through the night in pouring rain to Manali and then onto the snow bound Rohtang Pass. They didn’t believe me but who cares! Let them drown themselves in Bintang while I immerse myself in the Bali countryside, sampling the delights of going where no faint hearted expat had driven alone before. I checked the brakes of the Feroza, a sturdy out of production jeep much like the good old Jonga to make sure that when I encountered the gnats (the locals on their two wheelers) snapping at my tail lights I’d be able to swerve and brake. The over 500km journey started from Kuta in South Bali along the coast through Tabanan to Gilimanuk at the western tip of Bali (where ferries operate for Java) then onto Lovina Beach in the North and back across the mountains in the centre of the island southwards to Kuta. The journey took me three nights and four days of revelations. Of course the local wine did help me during this delightful ordeal. When driving through Tabanan I lose my way and stop for directions at a Police Post. Before I could alight from the jeep a cop walks up to me and says, Kupu Kupu, while pointing to a road leading off to nowhere. I ask him what Kupu Kupu means and he waves his arms like he is in the Mardi gras parade. I figure that he is probably talking about a bird park. So I take a detour and head down the road to Kupu Kupu. I find it in Wanasari a small hamlet not far from the centre of Tabanan town. It turns out to be a butterfly park. I pay the Rupiah 50,000/- and enter the Park. It’s not really a park but a large area beautifully landscaped with flowering plants; water lilies, fountains and a “nursery” for the numerous chrysalises that have been neatly arranged like a clothesline. This exotic park is completely covered with a fine mesh to protect the denizens. A cheerful Balinese girl, Nyoman, guides me through the mini labyrinth of walks while announcing the tongue twisting names of the butterflies. The place is swarming with butterflies in all shapes; sizes and colours flitting from flower to flower like young beautifully painted ballerinas. The experience is ethereal. I feel I am in Neverland with Peter Pan and his buddies. The sensation is soon lost as Nyoman hands me a Tarantula at the end of a long stick politely warning me not to let the Tarantula climb to the end that I was holding. There are other insects not so creepy like the Rhino beetle and the large Stick insects that are male and female in one, sort of unisex. Imagine a stick insect taking itself out on a Date! Nyoman didn’t see the humour in this remark. Back on the road I meet the Kupu Kupu cop again who then gives me directions on how to get out of the town. In Bali the road signs have absolutely nothing to do with logic or for that matter the traffic. The drive to Gilimanuk along the coast reminds me of a stretch of road between Bombay and Goa. There are large coconut groves all along the coast. The sea on the left is grey and the mountains on the right are carpeted in lush green vegetation. A few kilometres short of Gilimanuk harbour I notice a sign, “ Welcome to Taman Nasional Bali Barat”. This was the National Park that so many locals had told me about at the warungs where I had stopped for a breather. A man walks up to me and introduces himself as a ‘Forest Guide’ named Bardi. He looks more like he is off to see a matinee show. His is wearing the famous Balinese Batik shirt. He asks for Rupiah 300,000/- to ‘guide’ me through he Park. I suggest Rupiah 50,000/-. We finally settle on Rupiah 100,000/-. Bardi is a talkative chap. Like all good Balinese he questions me about my life, age, marriage, children, women and the odd Hindi film star. His loud voice frightens away a herd of Samba. I politely tell him to shut up and offer him one of my Ramayana Cigars. There is a muffled silence for the rest of the trip. According to Bardi the park is either 19000 square acres or 19000 sq km. Apart from a small stretch of about 20km of dirt track, the authorities have kept most of the park out of bounds to all humans. I spot Wild Fowl, Eagles, Samba, Leaf Monkeys (large monkeys with long tails like Langurs except that these ones are dressed in black). Besides this the park is also home to Barking Deer, Salt Water Crocodiles, Commodore Dragons, the Spitting Cobras, King Cobras, Green Snakes, etc. Alas, the king of the jungle has left the place. The last Balinese Tiger was killed around the turn of the last century. I am soon on my way to Lovina a few hours away. As I approach Lovina the fields look different. Gone are the rice fields and instead there are vineyards stretching for kilometres. Certain Bali companies make a special Balinese wine from these grapes. I recommend you try the Rose. It has a floral bouquet with a sweet after taste and is an acceptable table wine. Lovina Beach is not really a beach. Unlike Kuta the beach is small and the sand is black. The coast is dotted with hotels, warungs and a large fleet of catamarans. I check into Bayu Kartika Beach Bungalows that is situated right on the beach. It’s a large property that has seen good days. The service if there was any is lack lustre and lethargic. I walk down to the local warung for dinner. Wayang the owner suggests I hire a boat the next morning to view the wild dolphins about 20 km off the coast. The price is fixed for Rupiah 150,000/-. At six am next day Kadek the boatman wakes me up and soon we are heading out to sea along with many other catamarans laden with tourists. Behind us the sun is rising over the hills and the sea appears black. Suddenly a school of playful dolphins appear cruising between the boats, leaping and racing one another to the utter amazement of the onlookers. Sitting in the low-slung catamaran I can’t help but feel one with them. In the crisp morning air there is the sound of laughter, clapping and splashing. The whole show is like a well-choreographed dance, the stage being set between the boats and the backdrop the many hues of the rising sun. The dancers are almost humanlike denizens from the deep come up to meet their avatars. Kadek tells me that Lord Ganesha takes the form of a dolphin in the sea. I believe him. The beauty, the joy and the power these gracious creatures project could only come from divinity. Chugging back to shore two adrenalin hours later I feel like I have just alighted from a giant wheel. My legs are woozy and my head bursts with excitement. Kadek points to a monument to dolphins on the shoreline. I now understand the reverence in which the Balinese hold dolphins. The boatman informs me that there is a hotel a short drive away that has wild dolphins in its many swimming pools and that one can actually swim with them. I immediately check out of the depressing hotel I am staying in and drive to Melka Hotel about twenty minutes away but not before stopping by the Holy Hot Springs tucked away in the hills. The water from the spring inside a temple is piped through to a bathing area where people can bathe and seek the Almighty’s blessings. At the hotel Karl Guenter Meyer a German who is married to a graceful Balinese called Mirah greets me. He has two angelic children. Karl and Mirah own and operate Melka Hotel. The sprawling grounds are home to wild dolphins, samba, barking deer, exotic birds and snakes, crocodiles, monkeys, porcupines and racoons. And by the way they also have over fifty tastefully decorated rooms (superior, deluxe) and one presidential suite. The moment I meet him I am dragged to the swimming pools where the dolphins are kept. Karl informs me that the dolphins had been rescued from the fishermen’s nets in which they were caught and that he has a full time Vet on the staff to care for them. There are three salt-water swimming pools in which the dolphins are kept; where children and adults can swim with them. 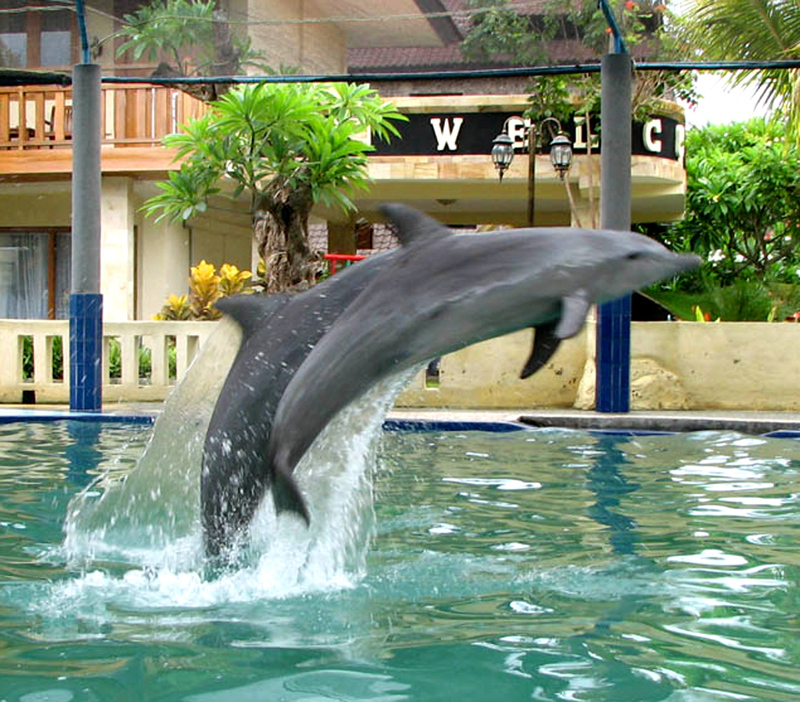 The dolphins in pool one are named Ucil and Gombtoh. These two are very mischievous. As I stand near the pool to photograph them in training, Gombtoh sneaks up under water and suddenly splashes me. In the other two pools are the three musketeers and an imaginatively named duo called Jack and John. John looks suspiciously like a Jane but I don’t mention it to my host and instead photograph them doing their act. The rest of the menagerie is amazing. The sambas eat leaves from your hands. While monkeys gently hold your hand. The Porcupines are like lap dogs and the Barking deer a bit skittish. The small kangaroos from Irian Jaya are cuddly. But crocodiles are rather aloof. I wish someone could make them look a bit more active. I want to enter the large enclosure to wake them from their reverie but Karl thankfully dissuades me. Karl is a true Indian Hindu. He has built the largest Ganesha in Asia on the hotel grounds. The imposing structure has Lord Ganesha majestically seated on top. On the first floor is Lord Shiva and Ma Durga while the ground floor has a sacred Shiva lingam. He has a full time priest. As I enter a priest appears and lights a lamp and begins chanting hymns to the Lord Ganesha. He offers me Prasad and blesses me. Karl narrates how he regularly visits his Indian Guru Mohan who lives near the hotel. He goes on to tell me that as a child in Germany he was fascinated by Lord Ganesha and would collect any image of his beloved god. His dream of honouring his god came true some years ago when he came to Bali looking for a bride and a home. He found his wife Mirah and with her started Melka Hotel. As his dream had come true he built the imposing statue of Lord Ganesha to honour his god who he first saw in Germany (as a six year old child) in the form of a small stone statuette. He patiently explains that Lord Ganesha’s avatar in the sea is the dolphin. This is why he had rescued the six dolphins and kept them safely in his large salt-water swimming pools. I tell him that his actions are good for his Karma. He doesn’t does say anything but grins like a Cheshire cat. In Karl and Mirah I can see the intrinsic love for each other and for their environment. I jokingly suggest to Karl that his hotel should really be called the Menagerie Hotel. Karl nods in disapproval. Probably he hasn’t read My Family and Other Animals. I thank Karl, Mirah and hug their two beautiful children Maharani and Mahaindra. As I drive out of the hotel with a lump in my throat it dawns on me that I had just witnessed a part of Bali I did not know existed. The wonders of true love between people of different races, colour, and religion all coming together in perfect harmony, like a symphony written by the dolphins. I had just danced with the dolphins and didn’t know it.